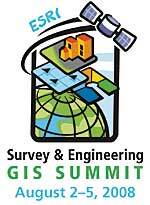 The 2008 Esri Survey & Engineering GIS Summit will be held August 25, 2008, at the San Diego Convention Center in California. Surveying, engineering, and GIS professionals will gather at the summitthe only event of its kindto discuss the latest trends, challenges, and solutions. Explore how GIS builds new opportunities for your business. For more information, visit www.esri.com/segsummit.